Rifton new pacer gait trainer - large is a system comprising an upper frame with a choice of bases, to accommodate clients with a broad range of abilities, in a variety of settings. New pacer helps in proper positioning and provides the dynamic weight bearing and weight shifting needed for a more natural gait pattern and easier stepping. New pacer encourages progress for clients so nothing stands between them and the places they want to go. New pacer trainer comes with the quality and dependability you rely on from Rifton. 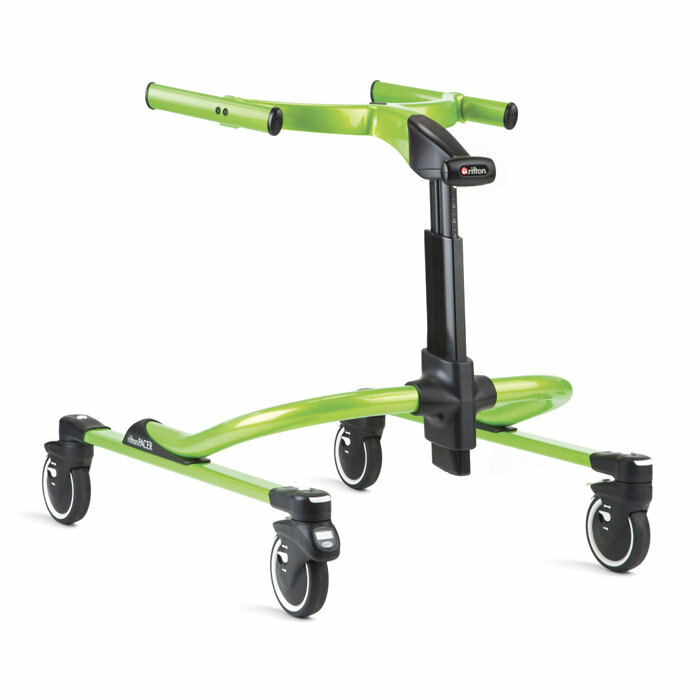 New pacer gait trainer is a versatile, adaptable and durable patient mobility aid. Dynamic movement - Dynamic upper frame accommodates the natural side-to-side and up and down movements of the body during step taking to facilitate a more effective gait pattern. 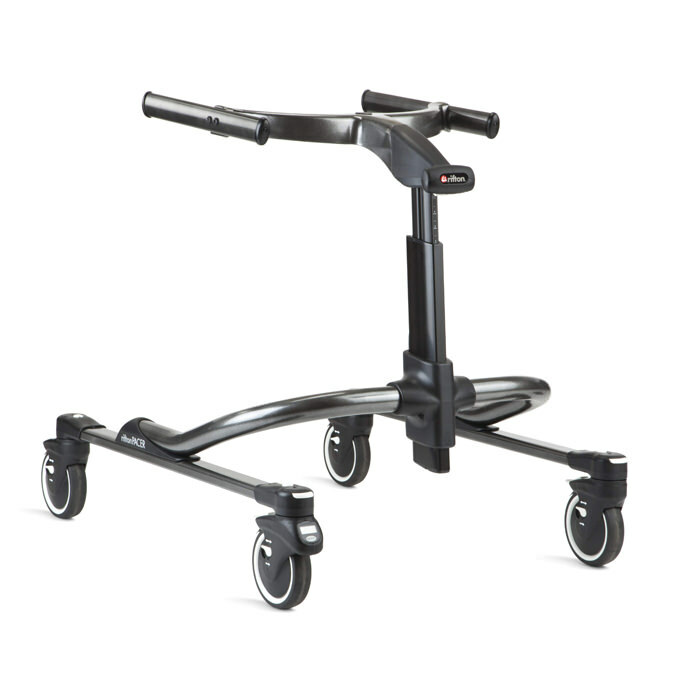 Dynamic weight bearing - supporting 3" vertical up and down movement during the process of walking. Dynamic weight shifting - providing support for 2" side-to-side movement while walking. Dynamic upper frame - A sophisticated, compact mechanism allows this upper frame to float 3" up and down and 2" side-to-side, providing dynamic body support. These powerful features enable the vertical and lateral movements that occur naturally as we shift weight from one leg to the other. Standard upper frame - is an economical choice for clients who do not need dynamic movement. It accommodates all Rifton prompts you're familiar with and depend on. Easy height adjustment - Both upper frames feature a single telescoping column with a gas spring to make height adjustment easy. A single button releases the gas spring for easy height adjustment. Release the button to lock it at any height. The column has been indexed for easy recording of positions between clients and sessions. Quick and easy positioning - The optional Multi-Position Saddle (MPS) offers quick, finely tuned positioning of the pelvis. Adjustable in four directions to accommodate each client’s posture, the MPS easily attaches to both the dynamic and standard upper frames. Smoother transfers - The optional MPS makes transfers, especially for heavy clients, so much easier (and safer). By placing the upper frame and MPS in their lowest positions you can ease your seated clients onto the saddle. Once the transfer is completed, caregivers can easily raise the client into an upright position for gait training. A measurable improvement - On every Pacer base as an option, Rifton’s new odometer makes it easy to record client progress in any setting, in either feet or meters. Easily transportable - The detachable upper frame makes it easy to stow and transport the new pacer. Separable components allow you to bring the right base for each client and every setting. The dynamic upper frame can easily fit into your trunk. 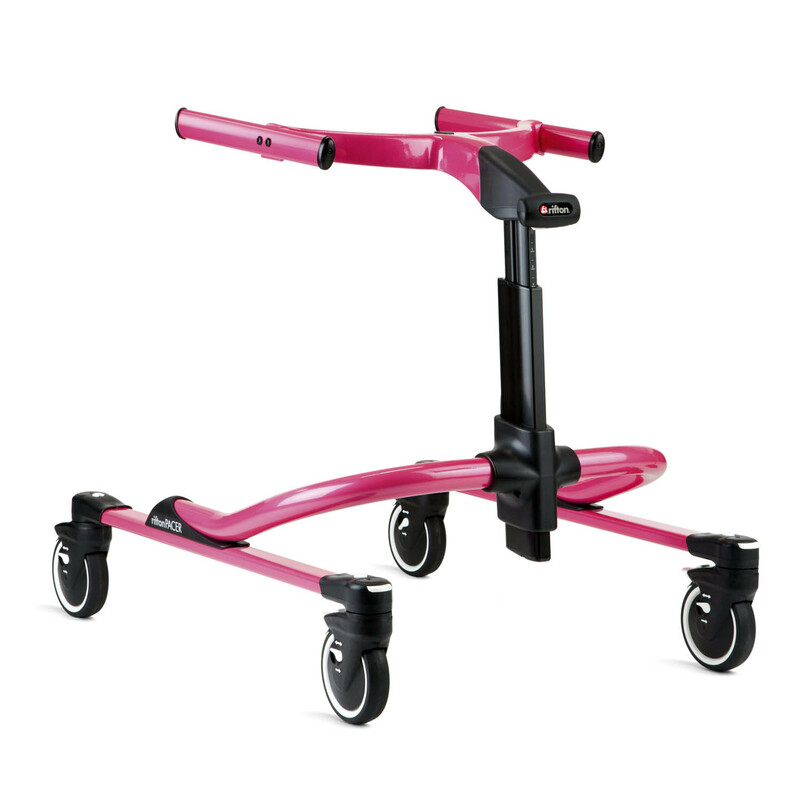 Frame colors - New pacer gait trainer is available in choice of 5 colors: Blue, Red, Lime, Pink and Gray. Floor to top of arm prompt 32" - 47"
Floor to top of MPS (not tilted)* 17" - 35"
Overall width Standard base: 28"
Overall length Standard base: 36"
Frame height Standard & utility bases: 28½" - 38½"
Treadmill/stability bases: 30" - 47"
Base height (without upper frame) Standard & utility bases: 16"
Treadmill/stability bases: 21" - 28½"
Dynamic upper movement Vertical: 3"
Maximum treadmill width Narrow treadmill/stability base: 29"
Maximum treadmill height Treadmill/stability bases: 11"
Caster diameter Standard & treadmill bases: 5½"
Utility base front casters: 8"
Utility base back wheels: 11½"
*This measurement is taken at the lowest frame and MPS height, and the highest frame and MPS height.